The Columbia River - "Roads and Trails, etc." Click image to enlarge Historic Columbia River Highway, at Multnomah Falls. View shot through front window, moving car. Image taken June 29, 2005. 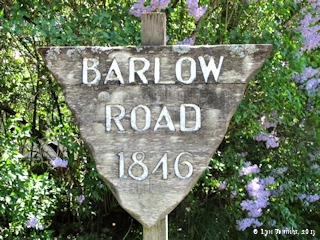 The Barlow Road --- "officially" the "Mount Hood Road" --- was a part of the Oregon Trail. The road was authorized by the Oregon Legislature in 1845, and by September 1846, it made its way around the south side of Mount Hood. This 80-to-110-mile road (it varied as the route changed over the years) provided an alternative to the dangerous and expensive route that used rafts to transport wagons down the Columbia River. During the Barlow Road's 70-plus-year history it passed through many ownerships and many improvements. In 1912, Henry Wemme of Portland became the last private owner of the Barlow Road. It was donated to the State of Oregon by his estate in 1919. Following the Historic Columbia River Highway. Logie Trail is an early native route which crosses the Tualatin Mountains linking the Columbia River lowlands to the higher Tualatin Plains. One mile upstream of Logie Trail lies Cornelius Pass. At one time the Logie Trail was the main trail connecting the Columbia River to the Tualatin Valley. 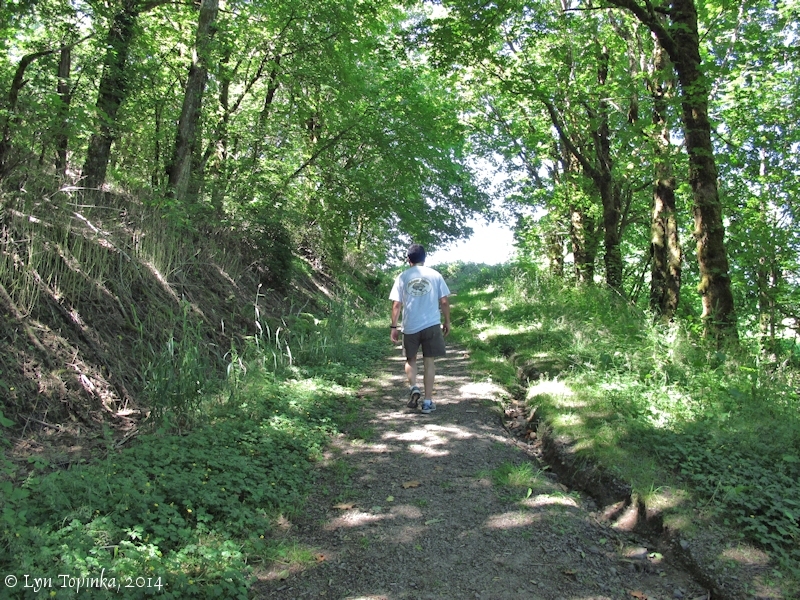 The "Klickitat Trail" ("Klikitat Trail") was a loosely defined "trail" of prairies and plains between the Yakima River and the Klickitat River drainages to The Dalles and Fort Vancouver. 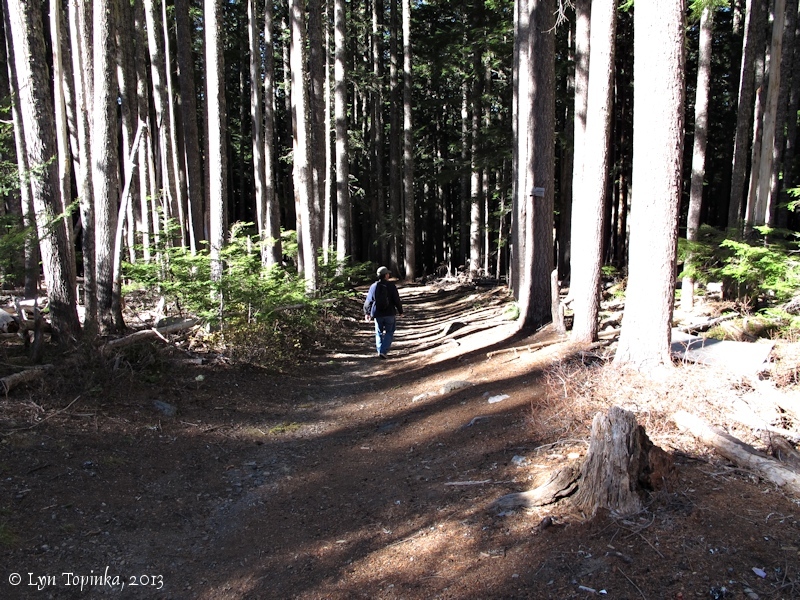 This "trail" allowed the indigenous tribes to move between central Washington to the Columbia River. The "Lyle Convict Road", built in 1910-1911, was a part of Washington's State Road 8, a road which was to link Vancouver with Spokane. The most difficult section to build lay just east of Lyle at approximate Columbia River Mile (RM) 182, where large massive Columbia River basalts at the Rowena Gap had to be circumvented. Unfortunately this road was never completed. 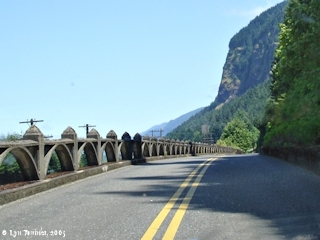 "North Columbia Highway", "Evergreen Highway", "State Route 8", "North Bank Highway", and the "Lewis and Clark Memorial Highway" are all names at one time used for today's Washington State Route 14 which follows the Columbia River, linking Vancouver with Walla Walla. The Great Northern Railway and Northern Pacific Railroad, competitors in the transcontinental business, launched the Seattle Portland & Seattle Railway in 1905 and built a line along the north side of the Columbia River. This line was known as "The North Bank Railroad", "The North Bank Road", "Columbia River Scenic Route", and "The Northwests Own Railway". The tracks were completed in 1908, with a celebration being held at Sheridan Point upstream of the Fort Rains Blockhouse location. In 1855 W.R. Kilborn built a portage road on the south side of the Cascade Rapids until Joseph Ruckel and Harrison Olmstead took over operations and improved the road. Between 1855 and 1862 the road traversed from the Upper Cascades (the Cascade Locks area) to the mouth of Tanner Creek (Bonneville Dam area). Horse-drawn carts on wooden planks transported goods and people around the Cascade Rapids. Their competition on the north side was the portage railroad of the Bradford Brothers. 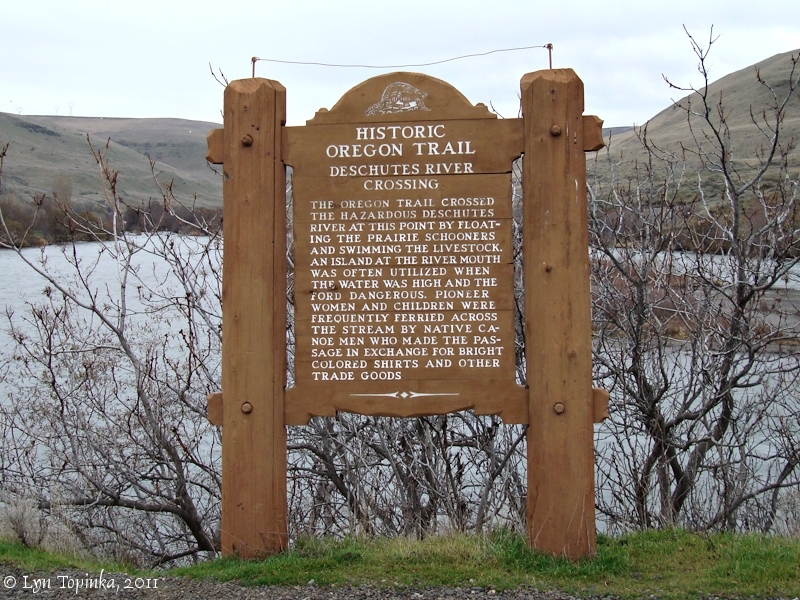 The Oregon Trail ran approximately 2,000 miles from Missouri to the Rocky Mountains and then to the Willamette Valley of Oregon. The trip took four to six months. Independence, Missouri, is considered the beginning of the Oregon Trail and Oregon City, Oregon, is considered the end. 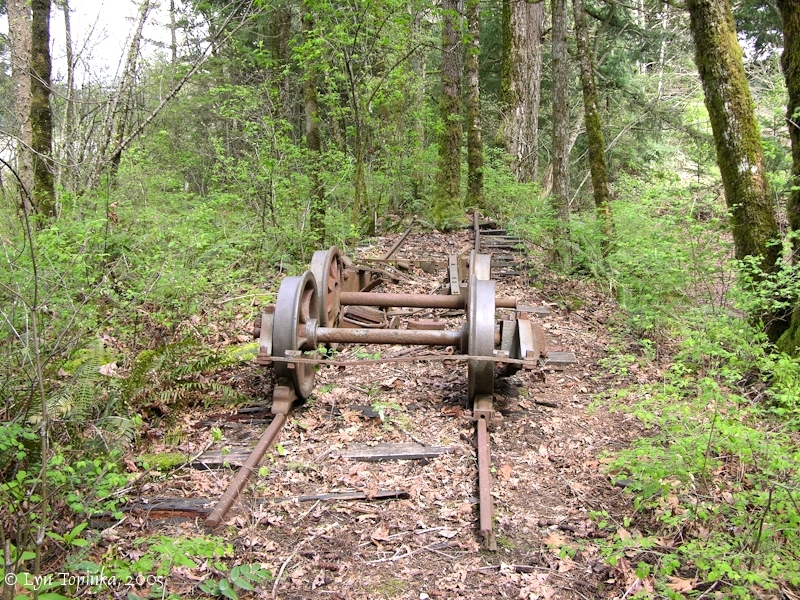 The trail was busy, lasting from the early 1840s and ending with the coming of the railroad at the end of the 1860s. Large scale migration began in 1843, when a wagon train of over 800 people with 120 wagons and 5,000 cattle made the five month journey. The Pacific Crest Trail is a 2,650-mile national scenic trail that runs from Mexico to Canada through California, Oregon and Washington. 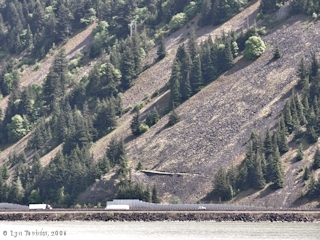 It crosses the Columbia River at Columbia River Mile (RM) 148, via the Bridge of the Gods. The trail is restriced to human and horse traffic only. 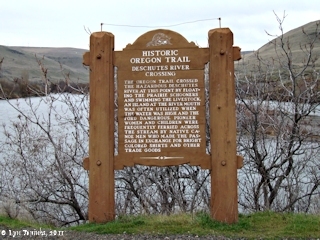 Click image to enlarge Sign, Oregon Trail Deschutes River Crossing, Oregon. Image taken January 30, 2011. 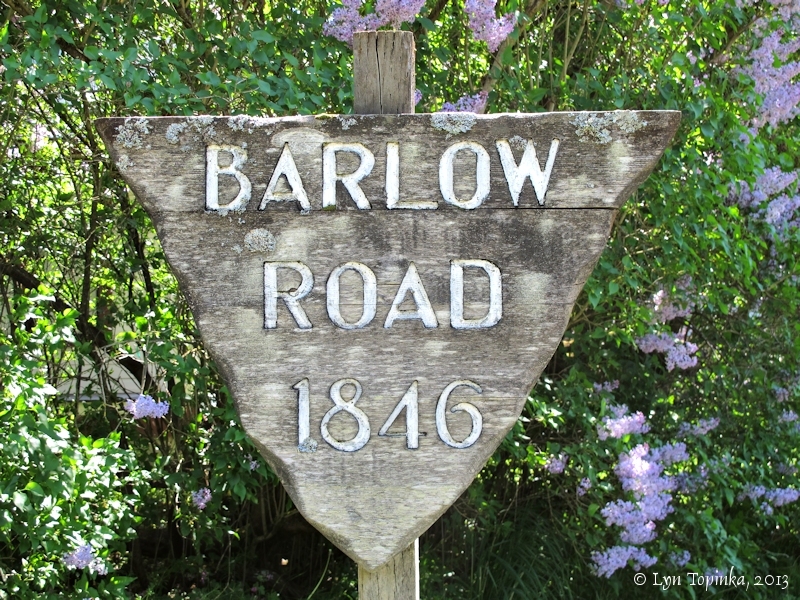 Click image to enlarge Barlow Road sign, Foster Farm, Eagle Creek, Oregon. Image taken May 4, 2013. Click image to enlarge Barlow Road trace, heading west from the Barlow Pass Sno-Park. Image taken October 22, 2013. Click image to enlarge Cascades Portage Railroad, Fort Cascades Historic Site, Hamilton Island, Washington. Image taken April 2, 2005. Click image to enlarge Information sign for the North Bank Road. 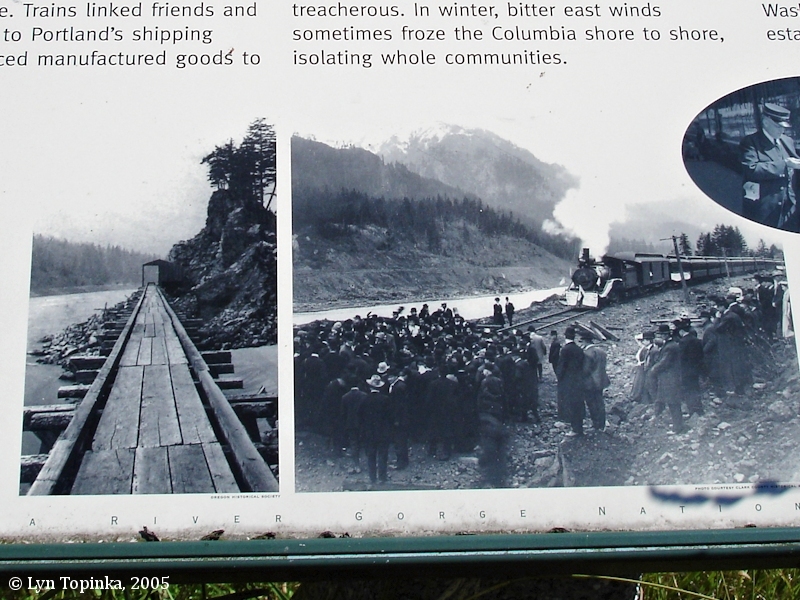 Caption for the left image reads: "Washington boasts the river's first railraod, which was built in 1851. A wooden cart on wooden rails and pulled by mules, it assisted early settlers around the Columbia's rapids. Despite this early start, modern locomotives were a long time coming." Caption for the right image reads: "In a driving rain on March 11, 1908, delighted locals joined dignitaries here at Sheridan's Point to celebrate completion of the Spokane, Portland & Seattle Railway between Pasco and Vancouver." Image taken June 29, 2005. 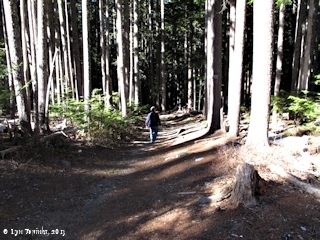 Click image to enlarge Remnant of the old Wagon Road on Shellrock Mountain, Oregon. View from Wind Mountain, Washington, looking south towards Oregon, with the Columbia River and Interstate 84 in the foreground. Image taken May 10, 2006. Click image to enlarge Rooster Rock to Chanticleer Road, Portland Women's Forum Scenic Viewpoint, Oregon. View of Road less than 0.1 mile from trailhead at Chanticleer Point. Image taken July 7, 2014.